Meanwhile, melt butter in large saucepan on low heat. Add flour, pepper and nutmeg; cook and stir 2 min. or until bubbly. Gradually stir in milk; cook and stir on medium heat 3 to 5 min. or until mixture comes to boil and thickens. Add 1-3/4 cups cheddar; cook and stir 2 min. or until completely melted. Drain macaroni; spoon into 8-inch square baking dish sprayed with cooking spray. Add cheese sauce; mix well. 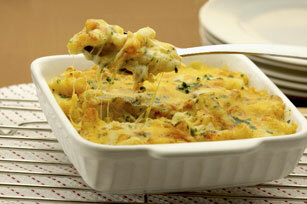 Combine Parmesan, parsley and remaining cheddar; sprinkle over macaroni mixture. Enjoy your favourite foods on occasion but remember to keep tabs on portions. Prepare using Cracker Barrel Shredded 4 Cheese Italiano Cheese, and substituting 1/4 tsp. garlic powder for the nutmeg.